The first-ever residential combination boiler from State comes with an industry-leading 4.8 gal/min domestic hot water delivery and 95% AFUE, as well as a superior space heating performance with up to 74% more heating capacity than other combination boilers. Easy installation makes the ProLine® XE Combi Boiler a great solution for a wide variety of residential applications. 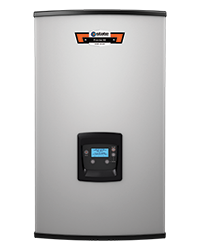 The ProLine® XE Combi Boiler comes with an industry-leading 4.8 gal/min domestic hot water delivery and 95% AFUE, as well as an easy installation.